GCA Altium acted as exclusive financial advisor to Migros-Genossenschafts-Bund, the largest Swiss retail chain with over EUR 25 billion revenue in 2016, on the sale of a majority stake in Probikeshop to Internetstores Holding GmbH, a subsidiary of SIGNA Sports Group. Probikeshop is the leading online bike retailer in France, Italy, Spain and Portugal. The company reached strong organic growth over the years through international expansion and strong credibility in its core market. 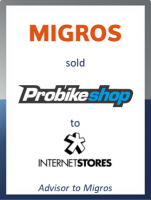 In 2011, Migros acquired 51% of the shares in Probikeshop from the company founder and CEO Olivier Rochon. With the support of Migros, Probikeshop increased its revenue from EUR 10 million in 2011 to EUR 70 million in 2016. Given its greater focus on the Swiss market, Migros decided to sell its stake to Internetstores, seen as the best possible strategic partner to support the development of Probikeshop in the long term. The 170 employees, including the founder and CEO, will be fully committed to the new group structure. All involved parties agreed not to disclose the terms of the transaction. This latest transaction sees GCA Altium build on its leading position as an international advisor within the Internet and eCommerce space, having completed 24 transactions in this sector in Europe since the start of 2015. Beat Zahnd, Head of Retail at Migros, said: "We are delighted to be able to hand over a developed start-up with highly qualified management and employees. With the sale of our shares to Internetstores, Probikeshop is now in the best position to continue on its growth path in Europe."